The race to colonize Mars is ongoing. However, it is not as easy as sending over people to live in igloo cities. We’ve already discussed the obstacles that astronauts must overcome on a voyage to Mars. But there’s far more to mystify us and conquer once we get there. The Red Planet’s geology is not fully understood, and the bits known by researchers include deadly phenomena capable of crushing the dream of human settlements. Apart from highlighting the harsh landscape, this mind-blowing world comes with epic geological mysteries and unique finds. In 2018, the Mars Express orbiter sailed past the Martian equator. Among the images beamed back was the odd photo of a cloud. The white streak stood out starkly against the red world and measured 1,500 kilometers (930 mi) long. More curiously, it appeared to originate above a volcano. 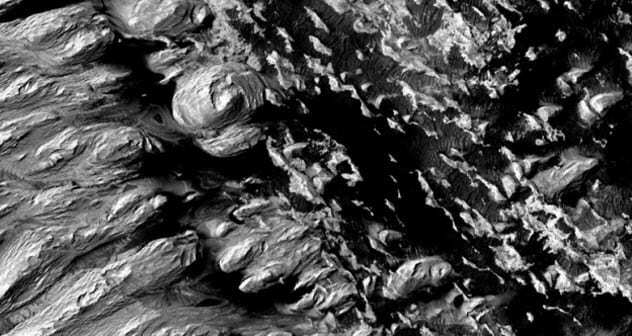 The possibility of an eruption was zero—Arsia Mons was a long-extinct volcano. 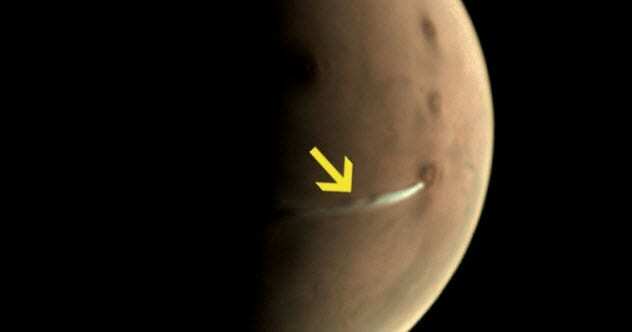 In fact, the last time that Mars saw any kind of eruption was millions of years ago. However, there was a chance that Arsia Mons spawned the vapor. Clouds often shroud the dead volcano, but the only ones resembling the 2018 fog trail are found on Earth. Called orographic clouds, they form on the downwind side of mountains. Air gets pushed uphill where it spreads, cools, and condenses on dust particles. Oddly, clouds resembling this phenomenon have appeared near Arsia Mons’s peak every three years since 2009. The 2018 cloud fit this pattern perfectly. The InSight lander touched down on Mars in 2018. The high-tech device’s main purpose was to find out more about the planet’s interior. After arriving, the lander had some free time while adjusting to its new surroundings. Scientists decided to listen to the wind on Mars, and for the first time, they managed to do so successfully. The ultrasensitive equipment and sensors picked up sounds audible to humans as well as frequencies in the infrasound range. NASA recorded both, and the result was eerie. One researcher described it as a mix of Earth’s wind, an ocean roaring, and something else that gave it an otherworldly quality. 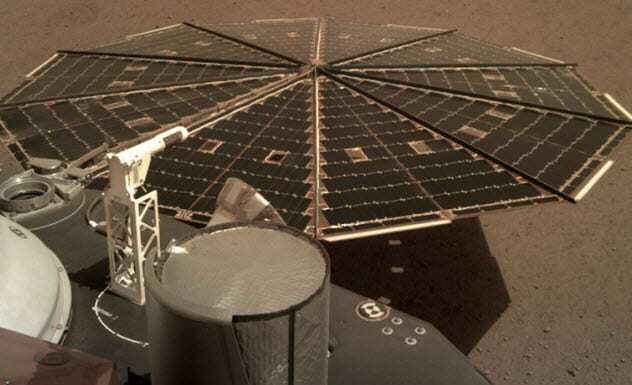 The wind gusts came from the northwest and blew across the lander’s solar arrays at 24 kilometers per hour (15 mph) and 16 kilometers per hour (10 mph). The recordings were made by Insight’s air pressure sensor and seismometer. When the lander’s real job began, researchers reversed their wind study and used the sensor to cancel the windy commotion because it interfered with the seismometer’s ability to probe inside the planet. In 1911, a Martian meteorite hit Egypt close to the village of El Nakhla El Bahariya. Thus called Nakhla, the space rock found a home at the Natural History Museum in the UK. In 2015, scientists reexamined it and found a first for Mars. The meteorite contained fire opals. On Earth, these breathtaking gems have a warm, flame-like tint. They only form in the ocean around hydrothermal vents. This type of opal is useful to scientists because it traps microbes during formation. This opened another avenue for looking for life on Mars. 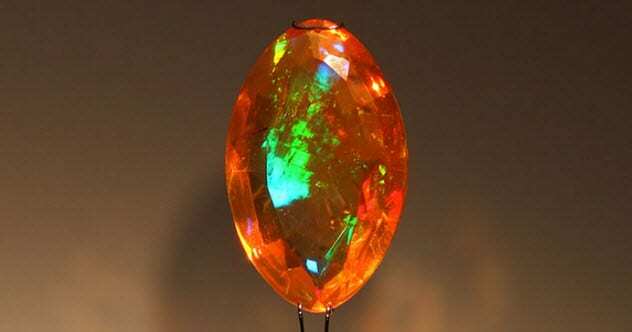 Previously, surface samples from the Red Planet suggested that opals could form in certain regions, but Nakhla provided the first direct gems. Under a powerful microscope, the Martian opals showed that they were a couple of million or billion years old and very similar to Earth’s. Unfortunately, the slivers were too small to look for life. 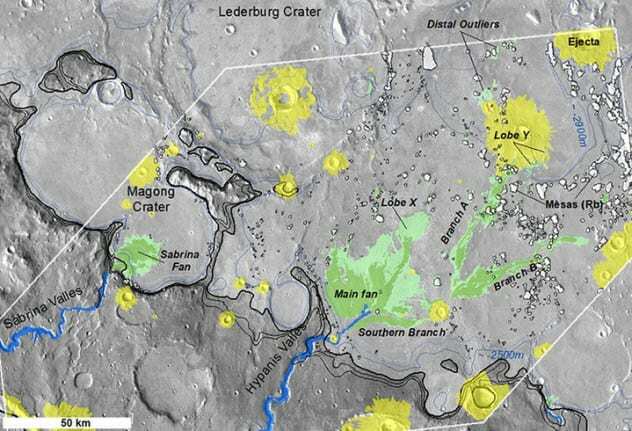 Future expeditions could target Mars’s opal regions for larger samples. In 2004, NASA’s Opportunity rover cruised around Mars. After a few months, it encountered something curious—tiny spheres—which scientists do not understand to this day. 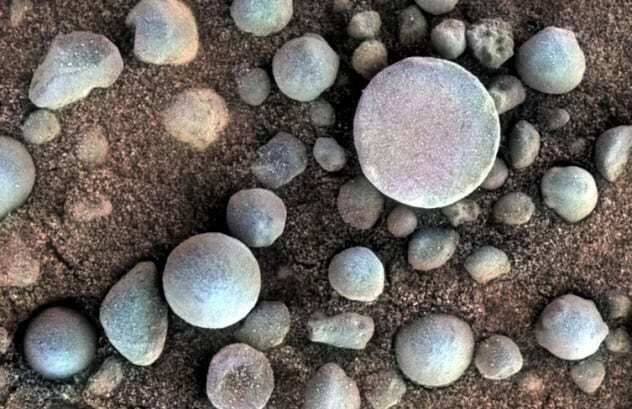 Working with false-color photographs that turned the spheres blue, researchers puzzled over the mysterious “blueberries” scattered around the Martian surface. Which geological forces created them, and what did that reveal about the planet’s past environment? Recently, researchers pounced on the nearest places that resembled the red wonder—Mongolia and Utah. To everyone’s excitement, they found something similar. The minuscule globes on Earth had calcite cores encased in iron and were likely shaped by a lengthy exposure to moving water. The “river pebble” look suggested that a lot of water had flooded the blueberry region. Scientists cannot be sure of the chemical makeup of the Martian spheres. If they can crack that riddle, it might reveal the chemistry of the water that crafted them and whether the region was habitable. In other words, they may discover if the water encouraged any form of life. The world of space news lit up with exciting news in 2003. NASA announced the discovery of methane on Mars. The following year, this was independently confirmed by the European Space Agency (ESA). It seemed like a done deal in 2014 when NASA’s Curiosity rover found more of the gas on the Martian surface. 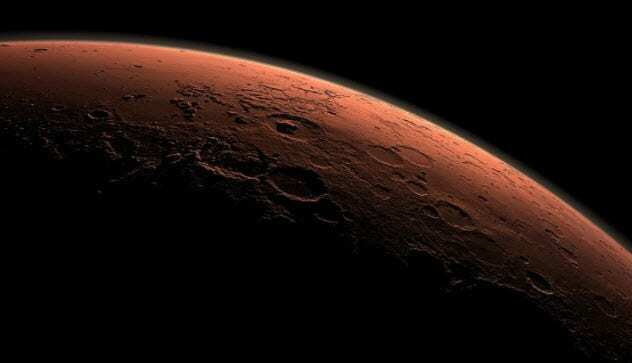 The atmosphere of Mars was packed with methane. Scientists were excited because this type of organic molecule suggested the presence of life. However, in the years that followed, the methane-rich atmosphere disappeared. In 2016, the first sobering realization happened when the ESA sent their ExoMars Trace Gas Orbiter (TGO) to the planet. It was outfitted with ultrasensitive sensors capable of picking up trace amounts of methane. As Mars had previously emitted copious amounts, nobody thought that TGO would report the methane missing. Two years later while still in orbit around Mars, it never detected any. TGO is not faulty, and a lot of its new data awaits crunching. It could still reveal the answer to the missing (or hidden) methane. The Opportunity rover was forced into hibernation during 2018. The reason: Lethal dust storms had completely engulfed Mars. This event highlighted an old mystery. The Red Planet has too much dust. Back on Earth, dust is the by-product of natural processes like rivers, volcanic activity, and moving glaciers. None of these are active on the Red Planet. Yet, about 3 trillion kilograms (6.6 trillion lbs) of the powdery stuff appears every year. In 2018, researchers found the source of the endless dust. Most of it came from the Medusae Fossae Formation. When the formation was first discovered in the 1960s, nobody really knew what it was. The massive geological formation, measuring 1,000 kilometers (620 mi) long, was identified as volcanic, which made it the biggest volcanic deposit in the solar system. Incredibly, the formation was once half the size of the United States. Around 80 percent of its porous material had already eroded, which created an unbelievable amount of powder. This was confirmed when dust everywhere on Mars chemically matched the Medusae’s trademark sulfur-to-chlorine ratio. In 2018, scientists investigated a site for a lander to park in 2020. This spot, Hypanis Valles, was once an ancient river system. During the check, the area revealed something amazing: Mars likely had a hydrological cycle that closely matched Earth’s—including a massive ocean. The study found the largest river delta ever discovered on the Red Planet. It left trademark deposits at the mouth of the river system which could only have formed if moving water had flown into a sea. One large enough to cover a third of the planet’s north. The presence of such big water bodies in the region had always been among the most critical mysteries regarding the geology of Mars. An ocean means that the desertlike world once had a water cycle supported by lakes, rivers, seas, and vast oceans. Scientists believe that this system was global and worked in the same way as Earth’s until 3.7 billion years ago. A rapid decline of some sort destabilized the cycle until it failed for good. Today, the Martian surface is devoid of liquid water. After years of exploring the Martian landscape, NASA’s Curiosity rover made history in 2018 and possibly solved the planet’s methane mystery. 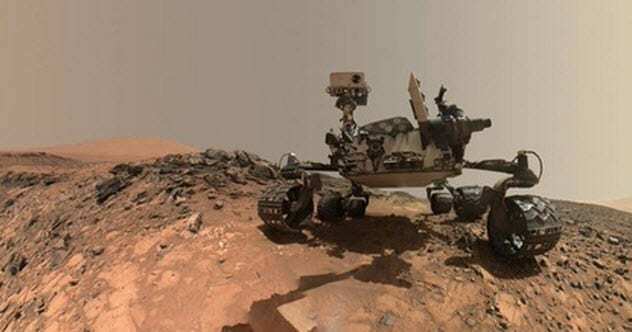 First, the samples it provided finally proved that there were biological compounds on Mars. Second, the rover’s observations gave a fair idea of where the methane went. Both developments were hailed as breakthroughs in astrobiology. The geological samples came from mudstone regions in the Gale crater, aged around 300 million years old. They revealed organic chemistry that was nearly identical to Earth’s mudstone but came from larger, more complex materials. Curiosity also found a pattern: The methane appeared and disappeared. Analysis showed the exciting results: The changes matched the Martian seasons. In the northern hemisphere, methane spiked in the summer and vanished during winter. Although the dynamics remain mysterious, one theory matched the rhythm. Crystalline water structures called clathrates could be causing the annual methane shift as they seasonally lock the gas in ice and then thaw. Scientists have a serious fixation about Mars colonies. The idea is to create a sustainable population and make humans a multi-planetary species. To be successful, generations must be born and raised on Mars. Nobody knows if that is even possible. The two biggest hurdles are radiation and gravity. Astronauts already endure space radiation, and their exposure is carefully monitored. The effects on a delicate fetus could be disastrous, resulting in serious abnormalities. Also, gravity on Mars is only 38 percent of Earth’s. Frankly, researchers do not have a clue how this might affect an unborn baby or a growing child. Tests on animals fail to yield consistent results. Mammalian reproduction in space is proving so complex that the best theories mean nothing. Not until people have babies on Mars or human embryos are tested in space can the real effects be gauged. However, this will cause so much ethical resistance that progress in that department is basically nonexistent. 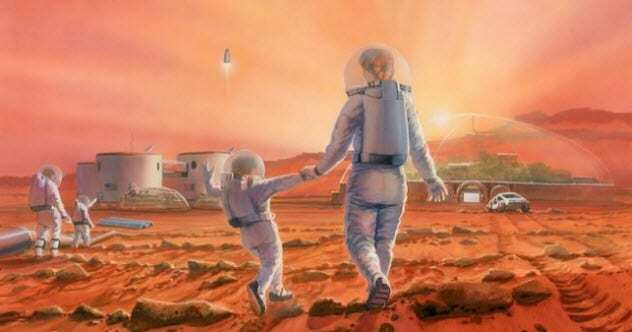 If humans want to walk and breathe on Mars, the planet needs to be terraformed. This means that the extremely cold temperatures and thin atmosphere must be manipulated to suit Earthlings. The first step would be to make Mars toastier with carbon dioxide. A 2018 study crushed that dream. There is simply not enough of the greenhouse gas. The study did a thorough check on all the planet’s carbon dioxide reservoirs locked away in rock and ice and found that, even if we released them all, it would still not be enough. Combined, the amount of gas would only triple the atmosphere’s thickness—a mere one-fiftieth of that required for terraforming. Another hurdle is our current tech level. Even if there was enough CO2 sealed away in the Martian landscape, humans do not have the expertise to perform what would amount to major alterations to the surface. There is still another obstacle: Mars does not have a magnetic field strong enough to hold onto an atmosphere. Whatever CO2 is released eventually drifts into space. 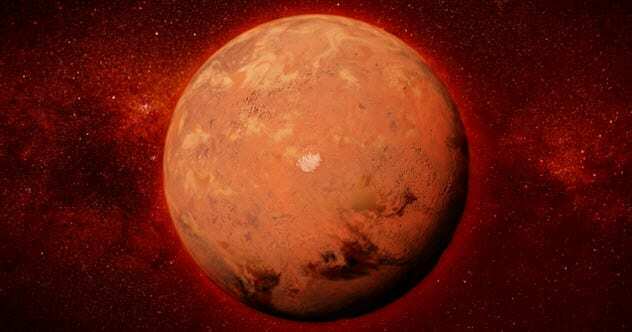 Read more fascinating facts about Mars on Top 10 Earthlike Facts About Mars and 10 Newly Uncovered Facts About Mars.